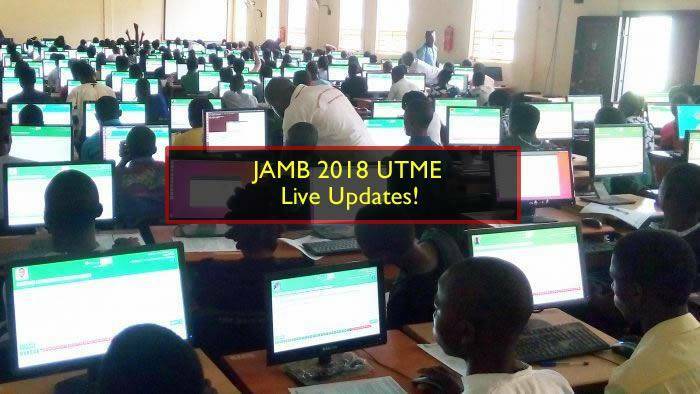 JAMB 2018 UTME 16th March - Live Updates! You are welcome to Monitor the Nationwide Progress of the 7th Day of JAMB 2018 UTME, this day on, 16th March, 2018. New comments and reports are added every minute. If you want to remain updated, you will need to reload this page as often as you can to check out new comments that have been added. Hi guy, I know this may not be the right place to type this but since there's no suitable place to do it, I'm just gonna dump this here. While y'all here celebrating (which I didn't object to) did did anyone just take a pause and think about the less fortunate.i read about a girl who committed suicide because she scored lower than she expected (of cause there's other back story). I'm directing this message to everyone that make use of this website and especially to you my school developer(still have a bone to pick with you guys) you guys should keep things minimal and try to to acknowledge those that are not as fortunate as you are, it's true that some of us are more intelligent than others but that doesn't mean we should rub it in on their faces, put yourself in their shoes and think of how they'd feel, how they'll think, the pressure they'll feel upon them. When a serious student fail, they don't take it lightly,They tend to think irrationally.the reason why I feel so concerned is because this is not the first case, same thing happened last year, about some dude in lagos. As we celebrate our success, we should also relate to them, interact with them, and console them. And let them know failure is not the end. And back to you myschool developer,last year you guys created a trend asking people to post the lowest score they've seen so far, I was wandering how you expect those people to feel when they see something like that. I'm only making reference to this so that it doesn't repeat itself this year. Instead of you guys to create a trend for orientating, consoling and advising them to keep reading and that failure is not the end of life, you guys are mocking them. It really very inhumane of you to pour salt on the injury. I'm sorry if I happened to step on some toes here but it all just doesn't seem right, we are all after the same goal, some are are gonna get it while some are not gonna be able to(at least it's not everyone that got 230 and above that gained admission last year) but that doesn't mean we should look down on them. Give them hope and make them believe they can be better than this. I just hope this reaches the right places. 86783471BC,PLS SOMEONE should check MY RESULT FOR ME,I WROTE ON Wednesday. What you said is actually the trueth,buh what about those that didn't want to prepare? And scored low and those that prepared but still couldn't get a good score?..so as for me sme one mocking me for having a low score is inturn imposing a challenges on my mind so I think for seruis ones that shouldn't make you depressed rather take it up as a challenges..and prove your mettle by bein so dogged. Ayo Oluwaseun: D exam is simple,in English: read ur vowel and consonant sounds also meaning of some dictionary words.in Independent: who is Suleiman's real mother,why did venessa leave dakar.literature: read native son,faceless,Othello. C.R.S:why was David called the man after God's heart.Datz all i can remember.